This is absolutely and most definitely a stunning statement piece ! It is a large tear drop of stunning Charoite with a fantastic deep purple colour and an amazing swirling pattern - exactly what you want to see on top quality Charoite. It has been highly polished and the finish is perfectly smooth. The stone, which is about 7mm thick, has been set in sterling silver which has been stamped with 925 on the bail. We can't convey how impressive this pendant is and it will look superb when worn. Charoite is believed to help with headaches, general aches and pains and with cramp. It is also said to help in treating disorders of the eyes and heart, in improving the condition of the liver and pancreas, and in normalising blood pressure and our pulse rate. 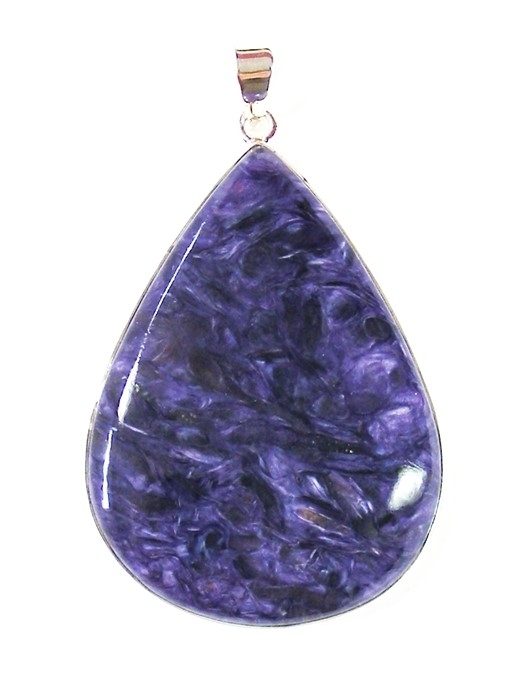 Charoite is also believed to help provide some improvement in autistic cases and to grant us a deep and restful sleep. Charoite can calm our mind and reduce stress and worry. It helps us to rid ourselves of frustration and obsessive and compulsive behaviour. It can enhance our analytical abilities and also the more caring, sharing and giving side of our nature. It also helps us to more readily accept other people whom we may meet. Charoite allows us to determine what is truth and what is fiction and helps us to realise that where we are at present is exactly where we should be for now. Charoite can help to combine the spiritual energy that we receive from the higher planes, with the more day to day energy that we experience on this, our physical plane. This balances out our spiritual side and grounds the spiritual energy we receive into Earth, grounding us and stabilising us, and making us more effective at spiritual healing. Charoite helps us to be of service to humanity and may also show us where our path of service lies. It also enables us to see visions more clearly and is a good cleanser of the aura.